templates for $9 each on Asia’s leading Royalty-Free marketplace. Singapore – August 25, 2017 – MotionElements, the leading royalty-free marketplace in Asia for worldwide stock video and audio content, has launched templates for Adobe® Premiere® Pro CC, including Motion Graphics templates for Essential Graphics Panel. These video templates allow non-professional video editors a perfect way to create videos easily. With the launch of the new products, customers are able to create motion graphics effects by customizing their templates in their Adobe® Premiere® Pro software. With Motion Graphics templates pre-designed by experienced artists, customers can create videos faster in Adobe® Essential Graphics Panel. These templates aim to fulfill video editors’ need of basic motions in videos ranging from lower thirds, logo animation, slideshow, intro, transitions and etc. With its easily customizable feature and affordable price of only US$9 per template, MotionElements is targeting video editors who have less professional knowledge in motion graphics but need to create videos – either for corporate campaigns or for personal events. Templates for Adobe® Premiere® Pro suit the needs of social media marketing and advertising executives for the promotion of products or services. The templates also help video editors expedite the process of creating wedding videos and memory slideshows a lot more efficiently. 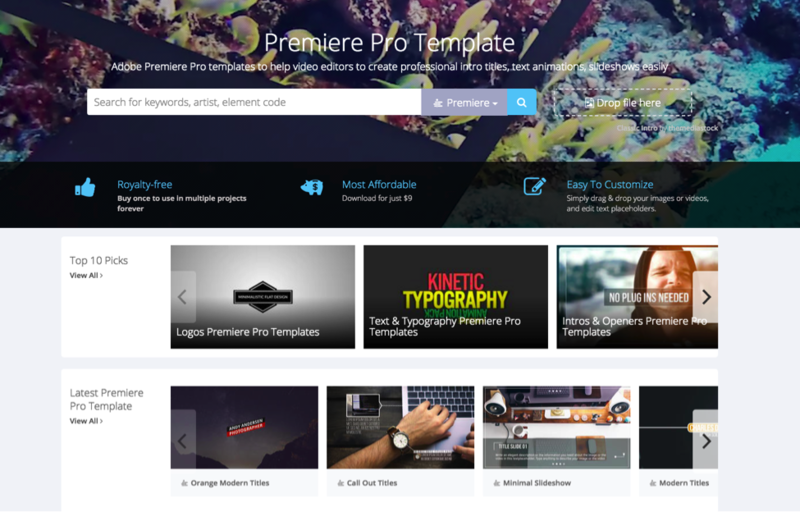 There are currently hundreds of templates for Adobe® Premiere® Pro and Motion Graphics in the marketplace. MotionElements is Asia’s leading royalty-free microstock marketplace for video creators by video creators. Founded by video professionals, the marketplace is powered by AI Search technologies for its library of over 1,900,000+ content, including stock videos, background music and video templates. The company has attracted venture backing from high profile investors including KK Fund, Incubate Fund and 500 Startups. Adobe, Premiere and After Effects are either registered trademarks or trademarks of Adobe Systems Incorporated in the United States and/or other countries. Apple is a trademark of Apple Inc. All other trademarks are the property of their respective owners.